The Curious Wavefunction: Book Review: Jacob Bronowski's "The Origins of Knowledge and Imagination"
Book Review: Jacob Bronowski's "The Origins of Knowledge and Imagination"
The late Jacob Bronowski was one of a handful of people in the 20th century who were true Renaissance Man with a grasp of all intellectual endeavors, from the science of Newton to the art of Blake. 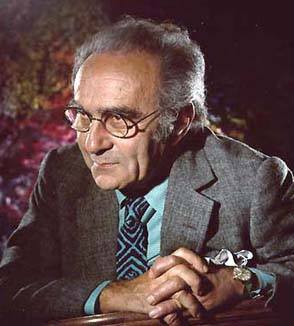 But more importantly, Bronowski was also a great humanist who understood well the dangers of dogma and the importance of ethics in securing the contract between science and society. His TV series and book, “The Ascent of Man”, is an eloquent testament and essential resource for anyone who wants to understand the history of science and its relationship to politics and society. His plea to all of us – delivered on a rainy, gloomy day in Auschwitz - to regard no knowledge as final, to regard everything as open to doubt, is one of the great statements on science and ethics of our times. Bronowski had an unusual command over the English language; perhaps because English was not his first language, his style acquired a simplicity and a direct, hard-hitting eloquence that would escape native English speakers. In this sense, I find Bronowski to be the Joseph Conrad of his discipline. In this book Bronowski takes on a different topic – an inquiry into the meaning of knowledge and our means of its acquisition. The book is based on the Silliman Lectures at Yale and is more academic than “The Ascent of Man”, but it is no less wide-ranging. Bronowski tells us how all objective knowledge is essentially derived, a point illustrated by a description of how the eye and brain conspire together to build a fine-grained picture of coarse-grained reality. He drives home the all important lesson that every experiment we do on nature is only made possible by making a "cut" that isolates the system under investigation from the rest of the universe. Thus, we are forced to sacrifice the connectivity of the universe and the knowledge we leave out when we make this cut when we do science. This fact by itself shows us that scientific knowledge is only going to be an approximation at best. If Bronowski lived in modern times, I feel certain that this discussion would digress into one about models and especially computer models. All knowledge is essentially a model, and understanding the strengths and limitations of models helps us understand the limitations of objective knowledge. Now knowledge has little value if it cannot be understood and communicated through language, and a good part of the book is devoted to the differences between human and animal language that make human language special; one difference that I hadn’t quite appreciated was that humans have the ability to break sentences down into words that can be rearranged while animals essentially speak in sentences, and even then these sentences communicate instruction rather than information. The most important part of the book in my opinion is the second half. Here Bronowski solidifies the theme of understanding the world through limited models and really drives home the open and uncertain nature of all of knowledge. There are a few essential springboards here: Bertrand Russell’s difficulties with paradoxes in mathematics, Alan Turing’s negative solution to the halting problem (the problem of whether there is an algorithm that could tell us for certain whether an arbitrary program on a Turing machine will halt) and finally, the twenty-four-year-old Kurt Gödel’s stunning incompleteness theorem. Bronowski ties together the themes explored in his lectures by making the centerpiece of his arguments the ability of linguistic and mathematical systems to engage in self-reference. Creating self-referential system was one of the powerful tools Gödel used in his seminal work. In Bronowski’s opinion, we found the limits of our knowledge when, in our attempts to turn mathematics and logic into closed systems, we found ourselves running into fundamental difficulties created by the fact that every such system will create paradoxes through the process of self-reference. Self-reference dooms attempts by human beings to gain complete knowledge of any system. This ensures that our investigations will always remain open, and this openness is one which we must recognize as an indelible feature, not a bug. Our political life too is predicated on openness, and not recognizing the open nature of systems of government can lead to real as opposed to merely intellectual pain and grief. The history of the twentieth century underscores this point adequately. There is an anecdote at the end of the book which I thought illustrates Bronowski’s appeal to openness quite well, although perhaps not in the way he intended. It’s also particularly relevant to our present trying times. Bronowski tells a story about emigrating to the United States from England during a political fraught time in the 1950s when everyone who dissented from orthodoxy was suspected of being a subversive or traitor. When he arrived at the port of New York City, an Irish-American policeman insisted on examining the books he was carrying. Bronowski had written a well-regarded book on Blake. The policeman took the book, flipped a few pages and asked, “You write this bud?”. “Yes”. He said, “Psshh, this ain’t never going to be no bestseller!”. And here’s Bronowski’s take on the policeman with which he ends the book: “So long as there are Irish policemen who are more addicted to literary criticism than to legalisms, the intellect will not perish”. Unfortunately, as has become apparent in today’s political environment, the kind of dissent and rugged individualism that has been the hallmark of the American experiment could be said to have swung too far. Perhaps the Irish policeman was exercising his right to individual dissent, but perhaps it also meant that he was simply too ignorant to have understood the book, irrespective of its commercial status. Perhaps, ironically enough, the Irish policeman might have benefited from a dose of the spirit of open inquiry that Bronowski extols so well in these lectures. To be fair to the policeman, the book wasn't a bestseller, so maybe he wasn't so ignorant after all.